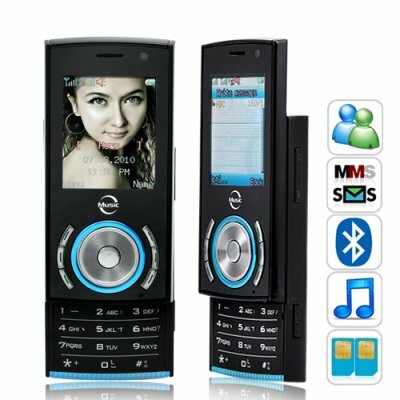 Successfully Added Fiesta Deluxe Pocket Slider Phone (Quad Band, Dual SIM) to your Shopping Cart. Introducing the Fiesta Deluxe Pocket Slider Phone - convenience, functionality, and affordability all in one. Small enough to fit in your pocket, light enough to hang around your neck, and packed full of features (including GSM quad band connectivity and dual SIM card slots), this Pocket Slider Phone is everything you need in a phone, and much more! It also includes a free 2GB micro SD card! The Fiesta Deluxe Pocket Slider Phone includes the same amazing special features you see in many of our phones, including GSM quad band connectivity for use around the world, dual SIM card slots / dual standby for getting two mobile phone numbers in one phone, and tons of multimedia and productivity features! For only a ~$60 cell phone, you have more than enough to brag about! The compact and highly portable shape of the Fiesta Deluxe Pocket Slider Phone lets you carry it around anywhere and with the slider design, your keypad is hidden away until needed, giving it a smaller profile and clean look! When you need to answer or make calls, do it instantly by easily sliding upwards - no answer key, no unlocking, just beautiful convenience! The Fiesta Deluxe Pocket Slider Phone (Quad Band, Dual SIM) does so much more than just act as a phone - it is also ideal as an MP3 player! Just load your favorite music onto the free 2GB micro SD card and hang the phone around your neck, either blasting music through the speakers or using the included headphones. Also when needed, you can turn on the front light and have this slider phone act as a convenient mini torch light! There is no better deal: The Fiesta is a feature-packed Deluxe Pocket Slider Phone and comes in a super convenient design - with mere ~$60 price tag! Click "Add to Cart" now, and we'll ship you a sample straight away so you can see for yourself how amazing it really is! Brought to you by Chinavasion, the leader in wholesale electronics and china mobile phones. Can I use MMS on this phone? How do I access the internet on this phone? Go to services, then E-Buddy. Note: For information about GPRS data fees and charges, please contact your SIM card provider. How do I toggle the torch light on and off? Press the middle button for 2 seconds to turn it on, then press it again for 2 seconds to turn it off. It will also automatically turn off after a few minutes.